When it comes to oddball and food issue sets, 1961 Post Baseball is one of the most popular of all-time. Giving collectors the chance to build sets and chase their favorite players through offers on cereal boxes, the release is equal parts large and ambitious. 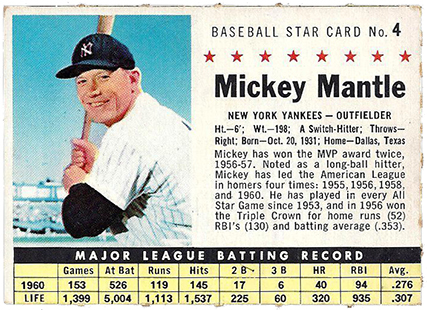 The 1961 Post Baseball set has a 200-card checklist. However, when you factor in all of the variations, a master set has more than 350 cards. Add to that, some players are short prints and you've got a big challenge when it comes to building the set. 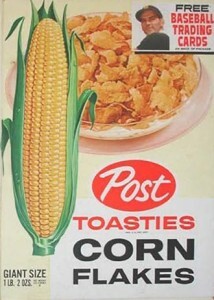 Cards came with ten different Post cereals including Alpha Bits, Sugar Crisp, Post Toasties, Corn Flakes, Raisin Bran and Grape-Nuts Flakes. Depending on the type and size of the box, collectors might have found just one card per box or a sheet with several of them. You could also mail away for a ten-card sheet of a specific player. These were printed on noticeably thinner stock, giving them a flimsier feel. These sheets and the cards that came with them are commonly referred to as company cards. Post got behind the promotion in a big way, even using Bugs Bunny and Yosemite Sam to pitch them in a TV commercial. Because cards had to be cut from boxes or the sheets, finding good condition cards can be tough. Not only have the cards had to survive several decades, but the original owner needed a steady hand as well. 1961 Post Baseball cards are done in full color. A tight shot of the player is in the top-left. There's a writeup and vitals on the right. 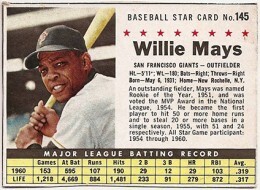 The bottom of the card has stats for both 1960 and the player's career. Backs are blank. Mickey Mantle, Willie Mays, Roberto Clemente, Yogi Berra and Hank Aaron are among the all-time greats on the checklist. Some of the more valuable short prints are Bob Shaw, Chuck Estrada and Roy McMillan. Besides the cards themselves, there are also a few items connected with 1961 Post Baseball that are extremely collectible. An album was made to house the set. A rare piece is a pinwheel display that was made for stores. 1961 POST CEREAL BASEBALL SHEETS NORM CASH, ART DITMAR, BOB PURKEY VERY NICE ! Unless noted, each card has both a box and company version done on different stock. Additional variations are noted.